Teenagers can be an infuriating lot, all self-consumed and unreliable, driven by whatever whim happens across their still-developing brains. We all know this and yet, somehow, Ben Jeffries—the co-founder and CEO of Influencer—never got that memo. He’s 22 now, but the seeds for Influencer were planted six years ago, when Jeffries was just 16 and starting a clothing business called Breeze. While his contemporaries were busy doing normal teenager-y things—like knowing everything and slamming doors in anger—Jeffries was busy trying to market his business on a shoestring budget. For the most part, influencer marketing was still a thing people were just experimenting with and the term “micro-influencer” wasn’t yet in the common vernacular. And while he didn’t have the budget to land a big name personality with millions of followers, he was smart enough to know he didn’t need to. It’s not like he had millions in inventory waiting to be sold. Jeffries naturally concluded that he could find someone who wasn’t as famous, but still had a relatively large and loyal following. This train of thought led him to partner with Jamal Blackman, a reserve football player with Chelsea FC, who started wearing Jeffries’s products in social posts. The success of this partnership had the effect of distracting Jeffries from his clothing company. As his sales increased and stock diminished, he cast Breeze off into the, well, breeze, and started thinking about what more he could do with influencer marketing. Influencer was founded in 2015, when Jeffries was 18, and got off to a rough start. The short version is that he laid out his vision for an influencer marketing platform to some developers who could code the thing for him, who proceeded to take his money and deliver nothing in return. That could have been the last straw, but instead turned out to be the final setback as Jeffries pressed on undeterred and crowdfunded Influencer. 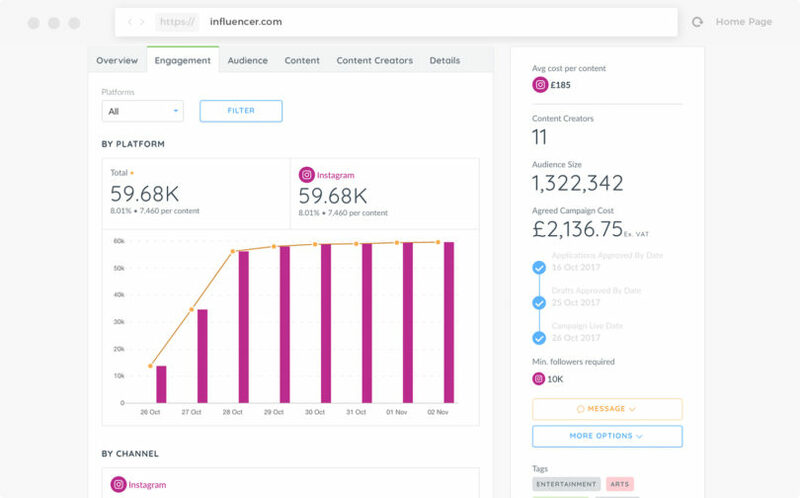 With a goal of £100,000, Influencer ended up raising £152,000 within three days. And with that, momentum was on Influencer’s side. Development continued on while YouTube star Caspar Lee joined up to become the company’s Chief Marketing Officer. This addition helped to shore up Influencer’s brand identity, calling themselves a service “run by creators, for creators.” This is Influencer’s biggest differentiator. 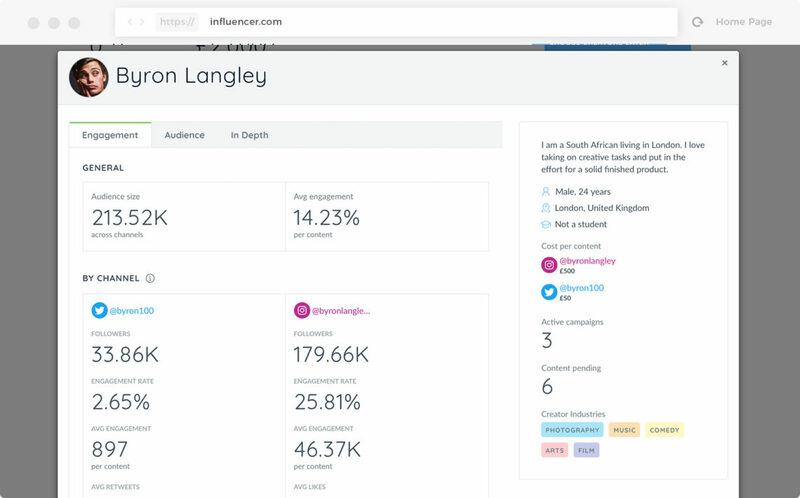 The platform itself is robust and impressive, with plenty of tools to help marketers manage their influencer campaigns from start to finish. But it isn’t appreciably different than any of its nearest competitors. By branding themselves as a company run by creators—and not running away from their Gen Z status—Influencer becomes more attractive to influencers, who’ll feel at home working with their peers, and the brands themselves, who will be eager to work with the people who grew up on influencer marketing and presumably know it best. And make no mistake, Jeffries and Lee definitely know their way around a marketing campaign. There are pros and cons to this approach, which we’ll get into in The Details. 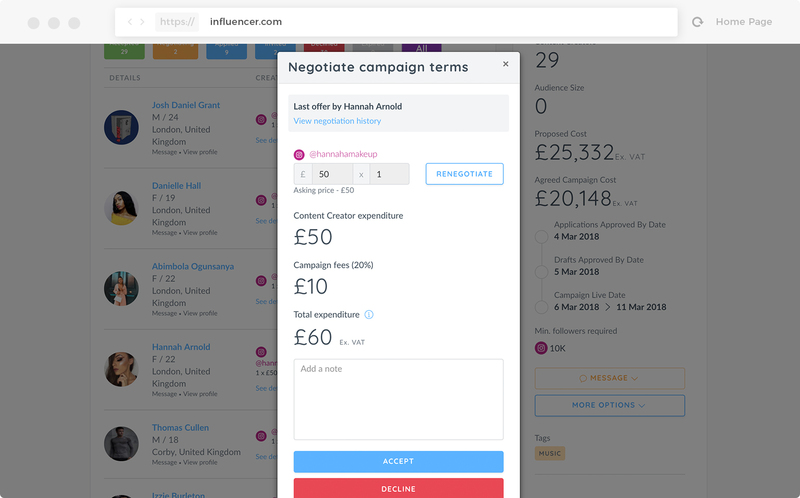 Influencer offers three levels of subscriptions for its self-serve SaaS platform, though there isn’t a fixed price for them. The prices vary based on the level of commitment—the longer you promise to stick around use Influencer, the lower your monthly or annual fee will be. Pay As You Go — Instead of a recurring subscription, you just pay per campaign. Your budget decides how much you spend on creators, and then you pay a 15% fee of the total spent. Doing it this way gets you 1 user account, limited access to the influencer database, basic search engine, campaign tools, and basic analytics for creators and campaigns. Starter (monthly fee, 6 month minimum) — 1 user account, 2 campaigns per month, full access to the influencer database, advanced search, campaign management tools, detailed creator and campaign analytics, and custom legal documents. There are no campaign fees, and subscribers get a dedicated “success manager” for any phone assistance needed along the way. Scale (monthly fee, 6 month minimum) — Includes everything in the starter plan for 5 user accounts and unlimited campaigns, plus data and analytics exports. Also, the dedicated success manager will do in-person results consultations. 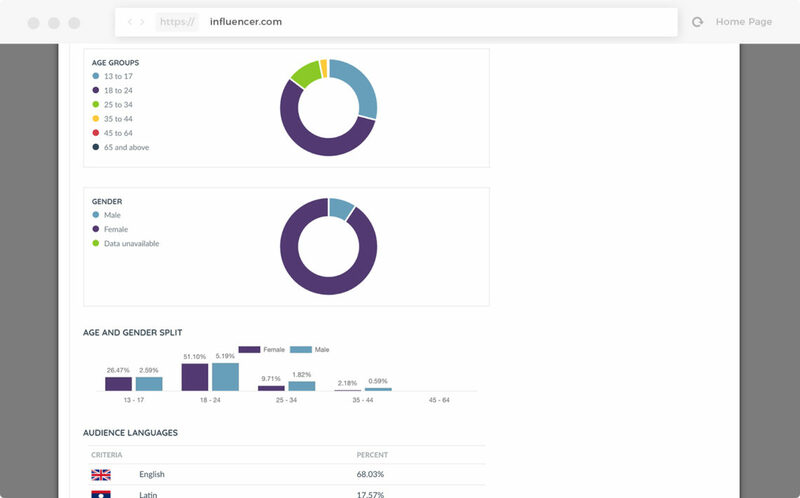 With their managed service, brands hand over all control to Influencer, with a minimum campaign budget of $10,000. We're going to do things a little differently than I’ve done for past reviews—before we get into the features and functionality, let’s side-step a bit over to Influencer’s philosophy and approach to influencer relationships. The company’s branding sets it apart from other marketplaces in some key ways, and it’s something that should be expanded on, alongside the listing of all the features and benefits of the platform. We'll get to that, but also say upfront that the software is excellent. Keep that in mind as Wefirst discuss the limitations of Influencer’s brand. Not only are they ”run for creators, by creators,” but Influencer’s brand story relies heavily on the analogy that influencers are “like the cool kid in school.” Influencer doubles down on this Cool Kids approach by being extremely selective about which creators they actually let on to the system. It isn’t just a numbers game for them—they’re looking for more than followers and engagement rates. They’re looking for talent—cool, hip, talent who can communicate with their followers more effectively than any over-30 marketer could ever hope to. They also host meetups and events for the creators they’ve brought on, giving them a chance to network directly with the Influencer team, very important when you consider that part of the business is running campaigns for brands. 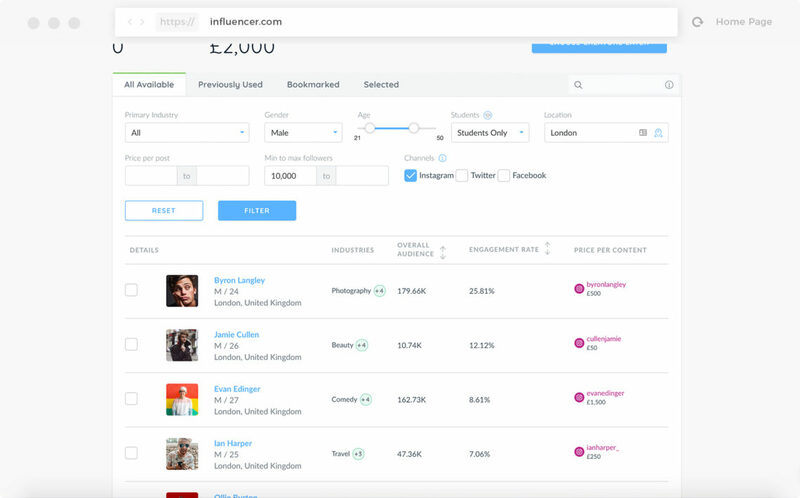 The team at Influencer will be more likely to select someone they’ve met personally for these big dollar campaigns. It’s an excellent approach, because it has the effect of making the brain trust at Influencer a kind of arbiter of what is and isn’t cool. If creators are the cool kids, and Influencer is run by creators, then the whole enterprise must packed with coolness. This, in turn, has two parallel effects: as word spreads about Influencer, creators will want to get on the platform even more, as a way to demonstrate their value. Meanwhile, brands want to work with the best creators, and will look to Influencer as getting a lot of the vetting and discovery out of the way before they’ve even logged on. (Note to those considering Influencer’s managed service: they clearly know how to market and create perceived value). But then here lies the limitation: right now, Influencer has a bit more than 1,000 creators. Even though this number will most certainly grow, it’s too limiting. Sure, the reach of those thousand could number in the hundreds of millions, but not every person you reach through your influencer is your target demographic. Still, the real issue here is being able to maintain that vibe of being a selective club while trying to grow the business. What happens if a brand discovers someone they really want to work with, but she isn’t on the platform? Good business sense dictates you make that happen for your customer, even if she was a creator the company wouldn’t have allowed on otherwise. Over time, this could dilute the talent pool, as well as damage the brand story of being a company run by influencers, for influencers. We'll start with the type of data that you get for the creators on the platform, because it’s extensive. And it also mitigates some of the concerns we raised around their geographical limits. Alongside the metrics that demonstrate a given creator’s reach and engagement, you can get very in depth insights on their audience. You’ll see where in the world their followers are, broken down by country and city, as well as the languages they speak. Many creators do have followers scattered around the globe, so even if they aren’t where you want to advertise, their followers may be. Additionally, Influencer deserves praise for its focus on the psychographics of audiences and creators, showing brand affinities, interests, and hobbies. Geography, gender, and age can only tell you so much about any given audience, but people’s tastes and preferences are powerful tools for creating the right message. If data insights can be used to persuade otherwise intelligent people to vote for Donald Trump, imagine what it can do for your targeted campaigns. Don’t forget, if you have this kind of information on audiences before a campaign, you’ll have it after, too. 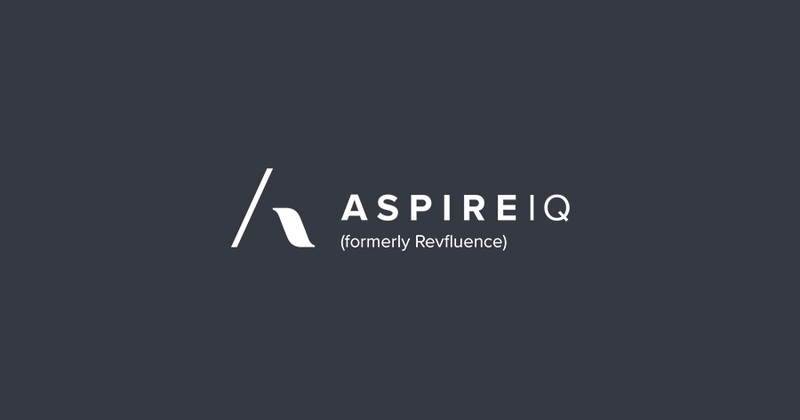 This is especially useful in identifying who your strategies worked for, and who they didn’t, allowing you to refine your approach with each successive campaign. The management tools you’d expect are all there, as well. Organising creators into campaigns, negotiating fees, and tracking their progress in the campaign lifecycle are all standard expectations, and Influencer delivers well on it. There’s also a great budget tracking tool that gives a real time view of how much you’ve spent/committed to spend. 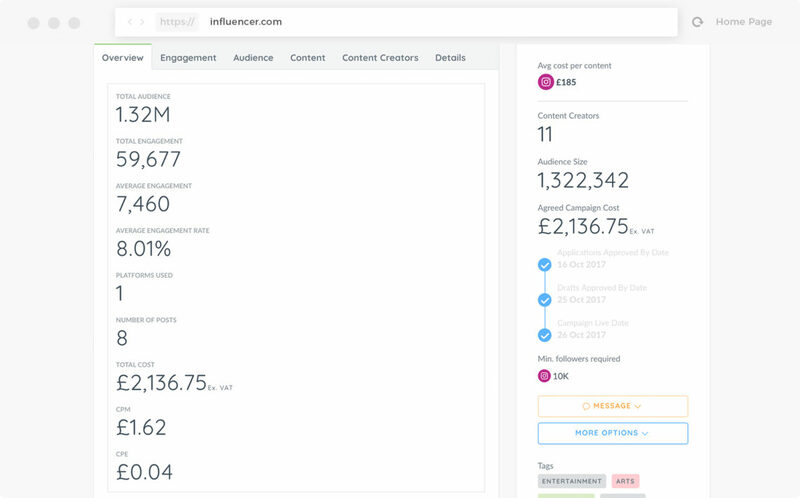 Your actual spend is then used as the basis for the after-campaign analytics, giving you the CPM (cost per mille) and CPE (cost per engagement), both of which are excellent measures of your campaigns success or failure. Again, Influencer deserves praise for including the ability to create and store customised legal documents, a feature which many other marketplaces unfathomably leave out. Finally, brands will be happy to know that what they do on Influencer can act as the foundation of some more traditional advertising. When influencers create content for brands on the platform, they’re also giving those brands exclusive re-usage rights. These can be deployed as sponsored posts across the social web, and brands will already know the kinds of audiences who respond positively to each piece of content. That makes targeting to new sets of eyes a snap—and because the content is already created, new sponsored ads can be created and used quickly and efficiently. 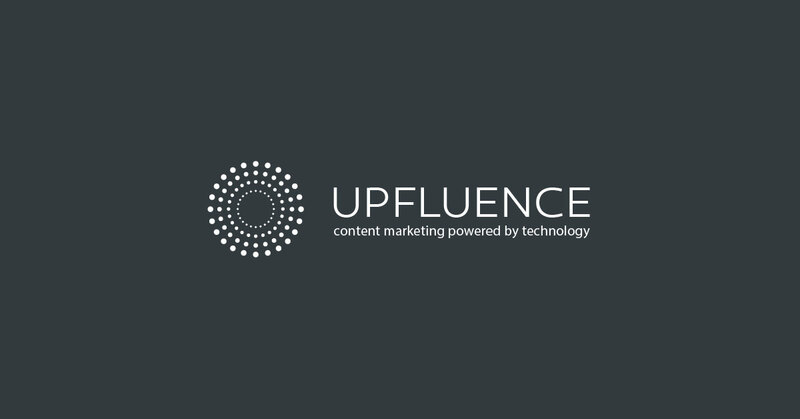 These examples of going above and beyond in certain areas are signs that the Influencer software was clearly well thought out. If there’s something that ought to be part of a marketplace, then it’s here. You’ll get all the functionality you need, plus a little more. And while Wehave questions about the brand story, and how that affects going forward, that shouldn’t detract from what they’re doing right now. 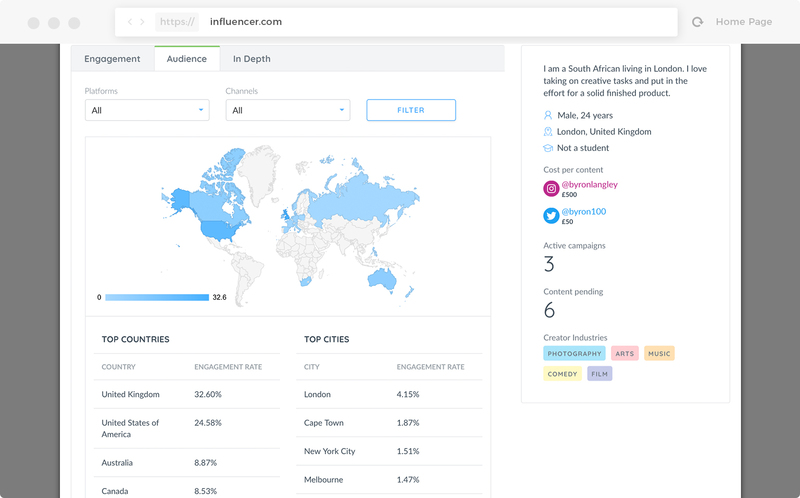 While the landscape of influencer marketplaces is often referred to as a “wild west” atmosphere, Influencer bucks that trend with what feels more like a boutique agency. 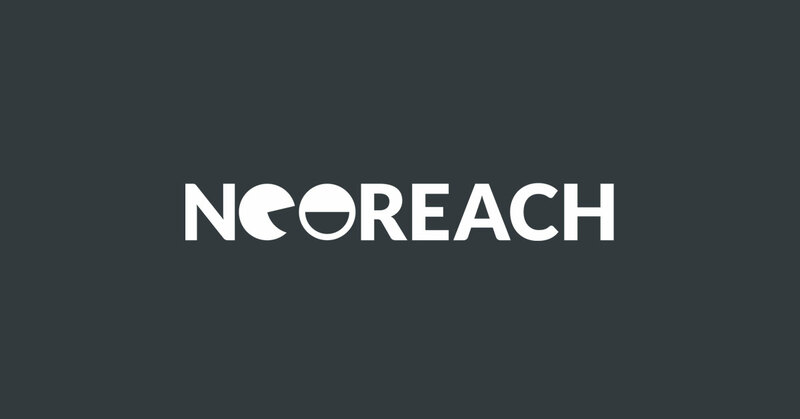 Their small size is actually a boon at this point, as brands can count on personalised service through their dedicated Success Manager, and the approach has landed them noteworthy clients like Uber and Nokia. The big question we have at this point isn’t whether Influencer is a platform you should consider (you should). Our questions only focus on the future. 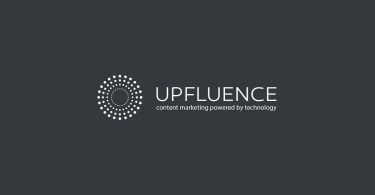 Can Influencer grow while maintaining the kind of service they’re providing? Can they continue to please their clients without jeopardising their role as influencer allies? It’s a delicate balancing act, but that doesn’t mean it can’t be done. None of these questions should dissuade you from giving Influencer a look, though. Every new company goes through some growing pains, and we’ll be keen to see how Influencer weathers theirs. They’ve accomplished much to be proud of already, so we won’t be surprised if they continue to impress.